Today's Draw Classic*: Princess of Wands from the Rohrig Tarot. Do you often forget that there's an unlimited source of healing and energy for you to access? What is your practice for drawing that energy in? What do you most need to channel right now? 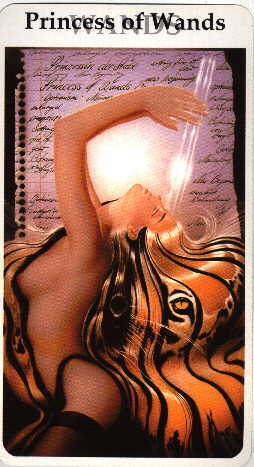 Today's card illustrates the energy exchange between humans and "source", most specifically the receipt of that energy. The words on this card include optimism and new beginnings. And the tiger in her hair is meant to signify sexual passions. But the crystal that's channeling light, along with two other phrases on the card—"enlarged perception" and "setting aside fear"—make me think of a channel that's always available to us to us from source. In one of the many Oprah/Iyanla shows I watch, one of them said something about how, if you have faith, you can't have fear. Think about it. It's true. Faith is the absence of fear. Faith puts trust where fear used to be. So how you do channel faith to replace your fear? Well, you could get nekkid in a G-string, arch your back and put a long, phallic crystal at your third eye, like the chick in the picture. Or another, more socially responsible way, would be to close your eyes and imagine a white light coming in from above into the crown of your head and down through your body. When you surround yourself in God's light like that, life feels safer. But what is really going to get you past fear is making a decision to believe in the notion that God brings you just what you need to fulfill your purpose here on earth. That everything is a lesson. There is no wasted experience. You are not brought to the edge of a precipice it wouldn't serve you to leap from. And there is a plan in place to serve your highest good and you can't possibly thwart it. Once you agree to that, then you just need to stop yourself every time you have a fearful thought and remind yourself of your commitment to that notion. But the lady in this picture isn't just channeling faith, she's channeling energy, too. And that's something I often forget...that I can replenish at any time, simply by surrounding myself in light and receiving it. Whether you call it God, source, the light or something else, when you draw that energy into you, it has significant powers to help you overcome fear, access energy, and heal yourself physically, spiritually and emotionally. That's why so many call it simply "source". When I get done writing this, I think I'll channel a little peace and contentment. How about you? The 21 Day Meditation Challenge with Chopra and Oprah is a good place to start and it's not too late to join in. Sign up for it at Oprah.com.